Q: Today the ROK president visited Pyongyang for the first time in 11 years. met with Chairman Kim Jong Un. What influence does China think this visit will have on the denuclearization of the Korean Peninsula as well as the talks between the DPRK and the US? A: This morning, President Moon Jae-in arrived in Pyongyang, the capital of the DPRK and met with Chairman of the State Affairs Commission of the DPRK Kim Jong Un. As a close neighbor to the Korean Peninsula, China welcomes and supports the efforts made by the DPRK and the ROK to maintain contact and dialogue, implement the Panmunjom Declaration and promote reconciliation and cooperation. This serves the common interests of the two sides and the region and meets the shared aspirations of the international community. We hope that the DPRK-ROK summit in Pyongyang can be held smoothly and achieve positive outcomes. We believe that this will help promote the denuclearization of the Korean Peninsula and move forward the political settlement process of the Peninsula issue. 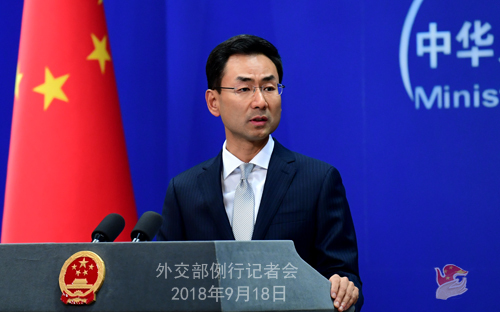 The Chinese side will continue to support the DPRK and the ROK in improving their relations and endeavor to make its contributions to the realization of lasting peace and stability on the Korean Peninsula and in the Northeast Asia at an early date. 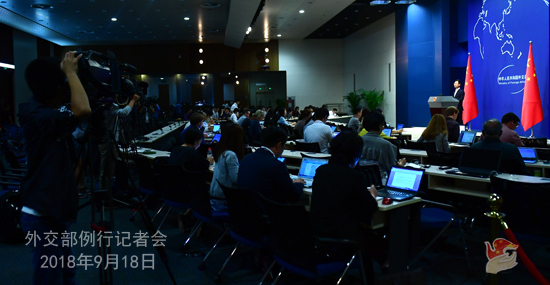 Q: Following the US announcement of slapping a new round of tariffs on Chinese goods, the Spokesperson of the Commerce Ministry has issued a statement, saying the measures of the US have thrown talks into new uncertainties. Does that mean China is considering refusing the invitation? With regards to actual retaliatory measures, do you have any specifics you can reveal? Would China consider taking more measures in order to get the trade talks back on track? 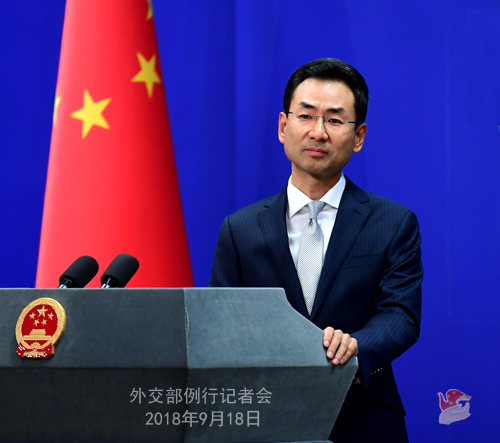 A: With regard to the US announcement of additional tariffs on $200 billion worth of imported Chinese goods, the spokesperson from the Commerce Ministry has already responded to that and I will not repeat it. I would like to reiterate that in response to the measures by the US side, the Chinese side will have to take countermeasures, resolutely safeguard its legitimate and legal rights and interests, and uphold the global free trade order. The latest steps taken by the US has also brought new uncertainties to the consultations between our two sides. We hope the US will realize the negative consequences of its actions and take credible means to correct them in a timely manner. As to the China-US trade talks, we have made clear our position on that many times. I believe you are all very clear about that. Q: Regarding the China-US trade disputes, could we presume that all the talks have broken down and the two sides now cannot go ahead with the negotiations? A: The Chinese side has been stressing that dialogue and consultation on the basis of equality, good faith and mutual respect make the only viable way out for the China-US trade issues. However, everything the US does for now gives no impression of sincerity or goodwill. Q: Do you have more details about the countermeasures China is going to take? And can you give us a rough idea of what measures other than a similar tariff response China might consider, for example, not giving out visas to US citizens? A: Like I said just now, in response to the US imposition of additional tariffs, the Chinese side will have to take countermeasures. As to what countermeasures we will take, I think they will be announced at an appropriate time. As to the presumptions you mentioned, I will not comment on that. Q: Do you think these tariffs are about trade or do you think they are about containing China's rise? Is this about a bigger goal from the US administration than addressing these trade deficit? A: As to the so-called "containing China" you mentioned, so far I have not heard of such kind of official statement made by the US administration. We have kept saying that a sound and steady China-US relationship not only serves the fundamental interests of our two countries but also meets the shared aspirations of the international community. We are willing to make concerted efforts with the US side towards this goal, but regrettably, the unilateral and trade protectionist actions taken by the US are unacceptable to China. Q: According to reports, on September 15, Pakistani Foreign Minister Shah Mehmood Qureshi visited Afghanistan, during which he met and held talks with the Afghan leaders and other officials. The two sides made positive remarks on improving their relations and agreed to continue moving forward the Afghanistan-Pakistan Action Plan for Peace and Solidarity (APAPPS) and advancing the peace and reconciliation process in Afghanistan. They also agreed to hold the second China-Afghanistan-Pakistan Foreign Ministers' Dialogue. What is your comment? As China is part of the trilateral Foreign Ministers' Dialogue, could you tell us about the preparations, considerations and expectations of the Chinese side for the dialogue? A: As a neighbor and friend to both Afghanistan and Pakistan, China hopes that the Afghanistan-Pakistan relations can develop in a sound and steady way and commends the relevant positive remarks made by the two sides. China supports the two countries in implementing the Afghanistan-Pakistan Action Plan for Peace and Solidarity (APAPPS) and jointly moving forward the reconciliation process in Afghanistan. We are willing to continue with our constructive role in the improvement of the relations between Afghanistan and Pakistan and actively promote China-Afghanistan-Pakistan trilateral cooperation. Now the Chinese side is in close communication with Afghanistan and Pakistan on the specific arrangements of the second trilateral Foreign Ministers' Dialogue.